Giving someone instructions on how to write feels a little silly. You just sit down and write. There really isn't much more to it than that. And for a first draft, you really shouldn't worry about more than getting words on a page. This isn't the time to perfect prose and employ every literary device. The idea is that you are telling yourself the story. Only when you go back and edit do you really need to concern yourself with word choice, grammar nuances, etc. But if writing a novel were as simple as just sitting down and writing until 80k words have come out, a lot more people would have done it. So if writing is so easy, how come it's so hard? In general, motivation is what fuels us to do things. 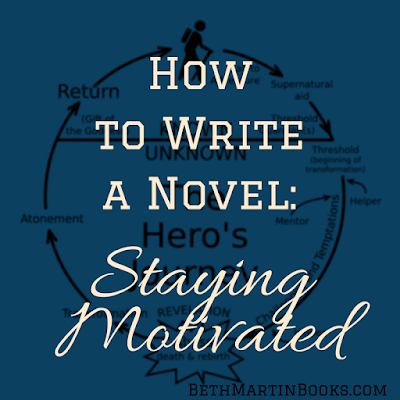 But how does someone stay motivated when making something that takes a ton of time like writing a novel? The harsh truth is that you probably won't. At some point, you'll get tired of your cool new story idea, and won't want to keep writing. So what do you do when the motivation to write fizzles? You keep writing. At some point during drafting your novel, you'll have to switch gears and really dedicate yourself to continuing your manuscript. 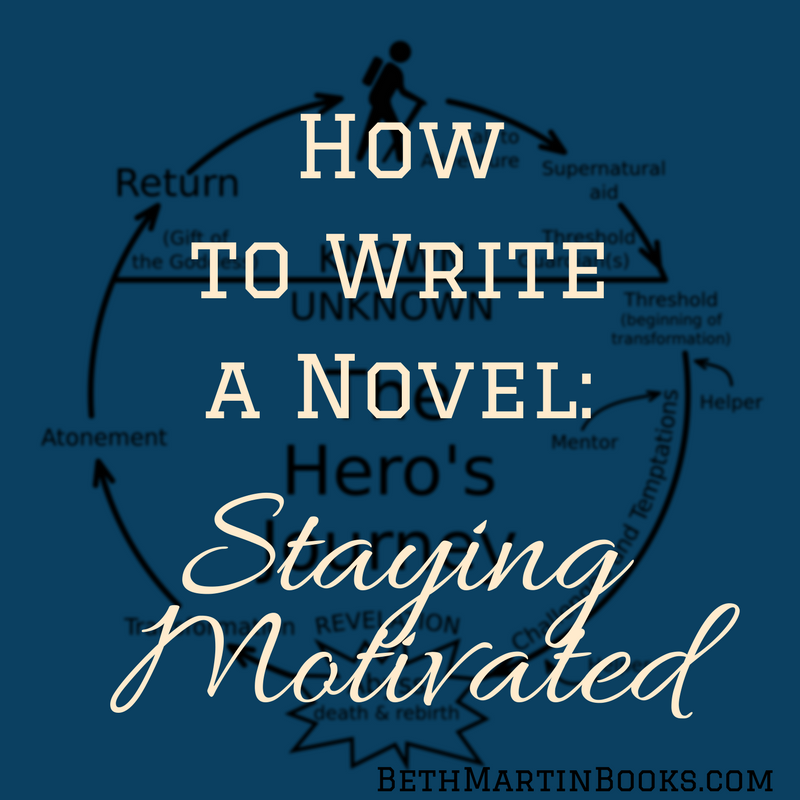 Dedication is the hard part, and this is a huge stumbling block for a lot of new writers. But if you decided that you want to finish drafting your novel, here are some tips on keeping on track. A lot of writers have a time and/or space carved out specifically for writing. Your writing space can be anything from a home office, favorite cafe, or dedicated laptop for writing. But more important is establishing a writing habit. While drafting your novel, you'll want to write every day. Find a time when you're productive and reserve it for working on your novel. Now use your writing space and time to work on your novel every day. It takes 30 days to make a new habit, so sticking to this the first month is crucial. When I go to the library of Starbucks to work on my writing, I make a conscious effort not to join their wi-fi networks. Otherwise, my precious writing time will be spent cruising the internet for pictures of cats. It takes a lot of discipline to write your novel, but it will be much easier if you can get rid of distractions. Turn off the TV and the internet and ask your partner to take the kids because you have work to do. Setting goals and reaching them can help bring back some of that initial motivation. Reaching milestones like 10,000 words or 100 pages are great times to celebrate. I have a much more in-depth post about making goals here. Just make sure to keep working on your novel even after achieving each goal. This works especially well if you have writer friends. I find it's much easier to give myself a pass then my friends will. "Beth, did you work on that book you keep talking about?" I don't want to disappoint the people that I've shared my writing journey with, and they're the people who can also help guide me back on track. You don't have to talk endlessly about your cool novel idea with your friends (that's actually a great way to lose the motivation to write your story down), just tell them you need their help by making sure you're sticking to that writing routine you made. Sometimes, it helps to just burn through the pages as quickly as you can before the motivation fades. Some writers are able to crank out the first draft before they even begin to doubt the awesomeness of their cool new idea. I envy these writers. But if you find yourself able to crank out 2,000+ words a day, then do it! Next, we'll get into some of the nitty-gritty with a more in-depth look at writing exposition.